I took these couple of pictures on a visit to Portobello Market a couple of weeks ago. The film was expired slide film anyway, and it went through the airport xray machine twice on my way to and back from Bulgaria, and it ended up with a large red section. Not an attractive red tinge, a muddy red effect that blew out highlights and blurred details. I took more pictures at the market, but they ended up unusable. That’s expired film for you. I prefer to go to Portobello Market on Fridays (and sunny Fridays at that). It gets too crowded on Saturdays, and I don’t like big crowds. There’s a bus that goes direct from my house to there, and if I get off early at Westbourne Grove, there’s a great place that does slices of cornbread pizza for lunch. On this occasion I ended up with a green pop art scarf, a seventies blouse and a Wild Nothing single from Rough Trade for a grand total of about a tenner. I love letterpress. This guy sells it on his stall for use, not just as a decoration, as you see a lot of people selling it. There’s a letterpress workshop at my university, and I did the training to use the facilities, but my project doesn’t really involve type much, and I haven’t had a chance to use it this year because I don’t live in Brighton and don’t get the chance on the days when I’m in Uni. 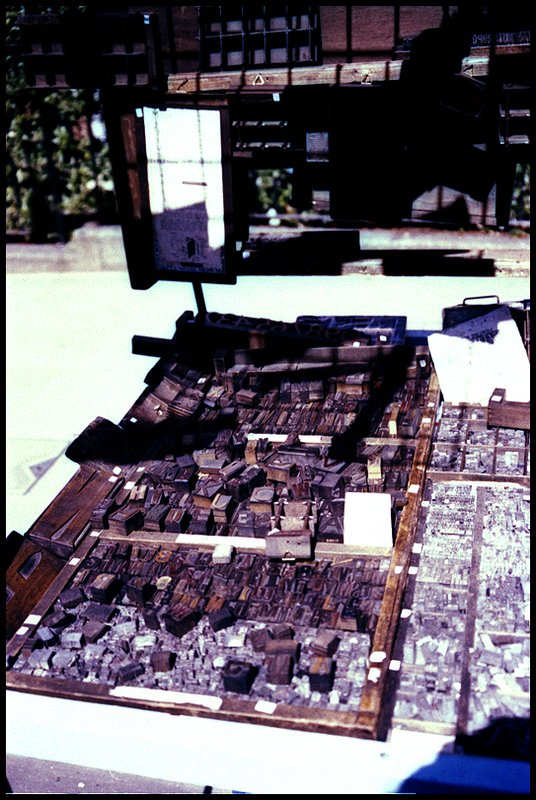 I’d love to have a small press of my own, but have nowhere to put it, and the ink is really messy. Same with screenprinting. In Canterbury there’s a small army surplus shop near the cathedral, run by an old man who will set and print things while you wait, as long as the thing you want printed is under 3 lines. I’m not sure what people actually use that service for, but he must get some call for it. The shot was totally red and low contrast with lost details, in the end the only way I could rescue it was to turn it into b&w, and it doesn’t look that great. 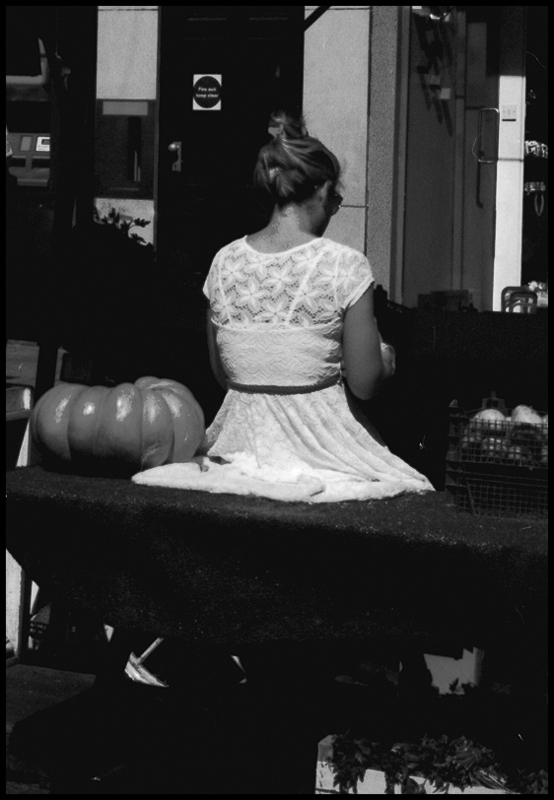 I just liked the way the woman running the vegetable stall was sat next to the pumpkin, in a fancy lacy dress, in a Cinderella kind of way.